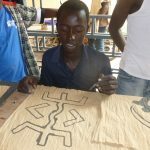 The son of two teachers, Kader is a talented and well know Malian artist, graduate of the National Institute of Arts in Bamako. 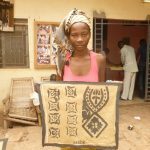 He specializes in ‘Bogolan’ an ancient and traditional Malian art form, using mud from the river Niger to create designs on naturally dyed fabric. He believes that ‘artists should contribute to the development of society’. He also expresses himself through dance, paints and other media. Kader is an exceptional man of quiet dignity, deep compassion and great inner strength. He lives with a disability and wears callipers to support his legs. However, as he says: ‘I am not handicapped either in mind or heart’ and ‘I am grateful for having been brought up in Bamako, where people with physical disabilities live with their families and are not considered a burden’. Kader is well known around Bamako where he can be seen riding his specially adapted three-wheel motor bike, often with children or materials attached. Maps and addresses are not very accurate, but taxi drivers can usually locate ‘Kader Keita in Lafiabougou, behind the cemetery’. Kader visited the UK in 2005 and 2006. 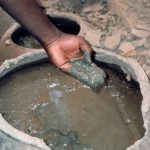 He appeared at WOMAD, spent a week as artist in residence at the British Museum and gave Bogolan workshops in schools and young offenders institutions. His most recent visit to France was in 2016 and he also works with artists and children’s centres in Guinea and other African countries.